Never underestimate something small, because it might be a weapon like this Wood Grip Hand Hatchet that saves your life, especially when you consider that any weapon is better than no weapon when faced with a hungry zombie. 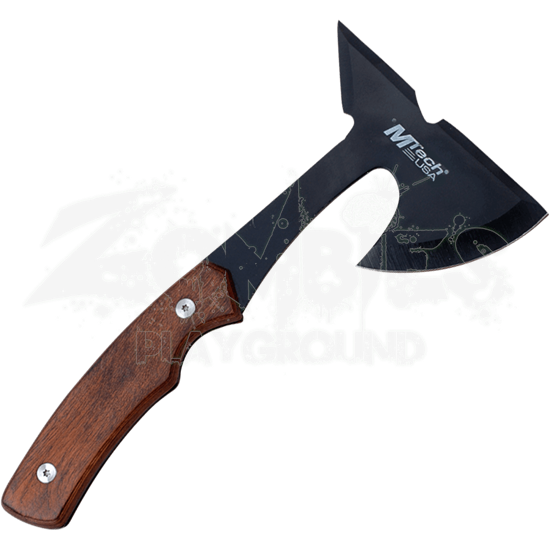 This hatchet is quite the handy little accessory, possessing a small enough size that rivals some utility knives, allowing it to be easily carried under just about any circumstance. The axe bit has a gentle curve, thanks to its bearded design, which adds plenty of edge for cutting and chopping, while the reverse poll features an angular spike for hooking and piercing. The axe is made using 440 stainless steel to provide a solid construction, as well as a hardly level of strength. Add in the contoured pakka wood handle, and you have a rugged hand-axe that fits easily into the hand and swings with practiced comfort and ease. The hatchet includes a nylon sheath that is perfect for protecting the blade when it is not in use. Sometimes, a knife just will not do. You need the chopping edge of the axe, and that makes this Wood Grip Hand Hatchet a great addition to your survival set, as you can carry it, along with a survival knife, without any trouble at all.